The Antarctic is under new management. Penguins. On the surface, they seem harmless enough - docile in fact - almost stupid. But look closer, and you will see that there is a criminal fraternity in the penguin group - a brutal and violent gang lurking under the cuddly surface. 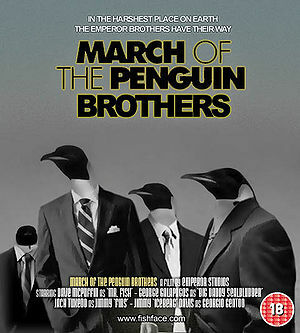 The March of the Penguin Brothers is an Oscar-winning documentary that reveals the dark side of the penguin. As a bonus, it also reveals the other side, which is all shiny and white, and kind of makes it look like they are wearing a tuxedo, which is just too cute. For those without comedic tastes, the so-called experts at Wikipedia have an article very remotely related to March of the Penguin Brothers. I drive a red Impala. I drive a red Impala - and by the way, this morning I saw a group of penguins shooting at each other. Scott later crossed the last part out, adding a comment: "Everyone will just think the poor bugger was nuts. Best keep quiet about it". Victorian society concurred with Scott, assuming Oates final remark to be some kind of sexual euphemism, and electing to keep it out of society drawing rooms. It wasn't until 1986 that the renowned actor and penguin enthusiast, Ralph Fiennes, found out the truth. Fiennes contacted Mel Gibson who agreed to finance a documentary as part of his unending search for the real Jesus. A team of genetically modified French film makers were sent to the South Pole along with director Guy Ritchie, who was glad to take a break from touring Madonna. What they brought back stunned the world and caused some elderly people to tear up their pension books. Everything that we had previously thought was true about penguins was wrong. "Kraaaawr Krrrrrraaaaar Kreeeeeeeeeeaar Kra Kra Kraaaaaaaaaawr" means "If you don't get off my eggs, I'll shoot your mother." After some initial setbacks, the film makers were able to investigate the dynamics of the penguin community - a dynamic of power and fear that has been twisted and distorted beyond all recognition, sat on, incubated, kicked around, frozen, bought and sold and put into a box. The team were blindfolded and driven to an undisclosed location where they had their first encounter with the notorious penguin brothers, Reg and Beaky. Reg opened the interview with what seemed like a casual question about his old ma, but Ritchie was quick to spot the potential trap and responded that Reg's old ma was a smashing woman, who'd do anything for ya, wouldn't she and that she makes a lovely cup of tea into the bargain. This response seemed to relax Reg, who put down the axe and began to expound on the history of how he and Beaky had built their empire. Testify! The penguin brothers started out low down the criminal food chain, pushing contraband krill to the Humpbacks in return for a cut of the environmentalist market. Up to this point, the whales had that market cornered. Greenpeace were in their pockets, and the whales had persuaded the governments of most of the worlds nations to leave them alone. No one, on the other hand, was working to "save the penguin" and this irked Reg and Beaky. One of the most poignant scenes in the film shows Reg trying to hold back the tears as he relates how a U.S. scientific team fired his cousin Ronnie from a mortar launcher for a laugh. Ronnie was badly disfigured in the incident and had to be dug out of a snowdrift. This is why, Reg insists, he had every right to go to the research station and force the scientists to eat half a ton of raw krill. From this point on, the penguins were made an official protected species, and Beaky could collect the protection money at the end of every month. For their part the governments of the world agreed to keep quiet about the brother's activities, and portray the penguin to their citizens instead as a somewhat dim and family loving bird, who enjoyed waddling all over the place in long lines and gamboling about looking for fish. Morgan Freeman played Reg as an honest farmer and Judy Dench played Beaky as a hard working gorcer in government issue films designed to teach children about the dangers of light bulbs. Under their international cover story the brothers' firm enjoyed a high turnover. Frostitution, Snow Powder and Seal Clubbing in particular proved to be profitable. It wasn't until the nineteen eighties saw the arrival of the notorious "Crayfish Twins" to the Antarctic. Feared across the oceans for their beatings and psychosis, the Crayfish twins were a formidable opponent for the Penguin brothers and most especially so as they arrived on the ice armed with a nuclear weapon. The showdown between the two pairs of crime siblings would be the penguin brother's Trafalgar - and would also be in it. The now legendary fight took place in the car park of the "Trafalgar" public house, somewhere between the eastern coast of Antarctica, and the western one. The Cray's tried to set off the bomb but it was proving difficult with just flippers, so Reg and Beaky stepped in and settled it the old fashioned way, with a tyre iron and a bag of sand. The Cray's were then bundled into Beaky's jag and dumped in a crevice. The brother's dominion now extended right across the known world, which is basically all of it except for parts of Wales and Canada. Bereft of enemies, and in control of much of the world's ice and microbes, the penguin brothers allowed Guy Ritchie and his team to film with impunity. Scenes of chicks holding Uzi's were destined to shock the American Right, who condemned the film as un-American, which it clearly was - so they also condemned it as anti-family, poorly lit and too noisy. The public received the film enthusiastically, however, delighting in the antics of the brothers and in scenes of senseless, meaningless and worthless violence - such as those showing eggs being used as footballs or "Congalining" - a practice common among drunk penguins. Martin Scorcese took a particular interest in the finished film, and has announced that he wants to make "GoodFlippers", a ruthless account of fearlessness and loyalty, starring Leonardo Di Caprio as your average p..p..p..p..p.... penguin pick up.